What is an Active Speaker? A proper active speaker is one that is fed non amplified sound, the sound is then split into the various frequencies required by the drive units and is then amplified by a power amplifier dedicated to that particular drive unit. This allows very close matching of drive unit and amplifier and allows the cabinet to be much smaller as the amplifier response can be tailored to match the cabinet frequency response. The frequency response can also be made to match that of the drive unit so the final sound should be more linear than with a passive speaker which has to cope with any amplifier attached to it. The earliest Beolab speakers are not actually active. The Beolab Penta is better described as a powered speaker as it has a power amplifier built into the base which produces a flat frequency response and then this is fed to a passive crossover before passing to the drive units. 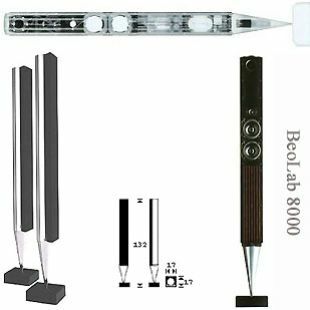 The Beolab 3000, 4500 and 5000 were also powered speakers but interestingly, the power amplifier produced an output with a non linear output designed to compensate for the reduced bass response of such a narrow speaker.